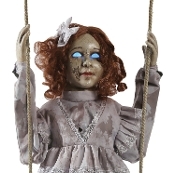 Add some creepy decor to your Halloween when you bring home the Swinging Decrepit Doll! The Swinging Decrepit Doll Animated Prop just wants someone to play with. Won’t you stay just a little while longer? She promises not to hurt you... Much! This creepy prop features an infra-red sensor, hollowed out eyes that glow an other-worldly blue, and speaks haunting phrases to all passersby as her rotating head turns side-to-side while she swings back and forth on her swing. Your haunted house will never be the same with the Swinging Decrepit Doll! Doll approx 30-inch (75cm) tall. Total length approx 65-inch (163cm) High.